1. Put sour cream, Hellmann's® or Best Foods® Real Mayonnaise and Lipton® Recipe Secrets® Onion Soup Mix into a medium mixing bowl and stir until all ingredients are thoroughly combined. This part can be done ahead of time and refrigerated if you like! 2. Right before serving, take a 1/4 cup each of the tomatoes and the lettuce and set aside to use for garnish. 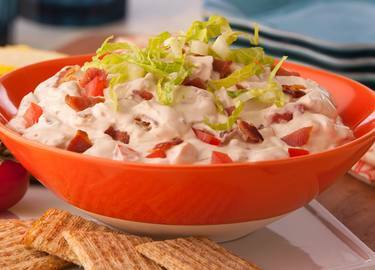 Add the rest of the tomatoes and lettuce along with the bacon to the mixing bowl and stir them into the sour cream mixture until everything is well combined. 3. Spoon the dip into your favorite serving dish. Scatter the reserved tomatoes and lettuce on top and serve with toasted bread, chips, crackers, celery or anything else that catches your fancy!